Google CEO Larry Page described Google+ last year as the “social spine” for nearly everything that the company offers its users on the Web. I understood the strategy and what Google was planning, but I didn’t like it one bit. After all, many of Google’s products work just fine in isolation. Take Gmail. Brilliant in the browser, as well as through a third-party email client or Google’s array of mobile apps. Or YouTube. Clips can be embedded and viewed anywhere on the Web, but there’s also the site, iOS and Android apps for perusing the community’s vast library of uploaded videos. I was sceptical about how Google might try to shoehorn Google+ into these well-established products. What benefits were there? I was convinced the social network would just add unnecessary friction to the Web, as well as more weight to Google’s already swelling product portfolio. Yet at the time, Google+ was (and still is) one of my favorite places to share and discover new content. None of my friends or peers used the service regularly, but it was (and still is) one of the friendliest, brightest and most engaging platforms for participating in thoughtful discussions. But for quite some time, I chose to ignore all of the hooks and bridges that Google was drawing up between Google+ and the rest of its products. I could see them being introduced with each minor update, but kept my blinkers up and just focused on the stream of fresh updates emerging before me. My stance has changed though. I’ve started using Google+ as an online image library, because it automatically uploads every shot captured on my smartphone. The photo-editing options are simple and professional, incentivizing shares with relevant circles or an active event page. Google Play Games also shows promise. For a long time, the mobile gaming scene has yearned for the social fiber that has helped Steam, PlayStation Network and Xbox Live to blossom. 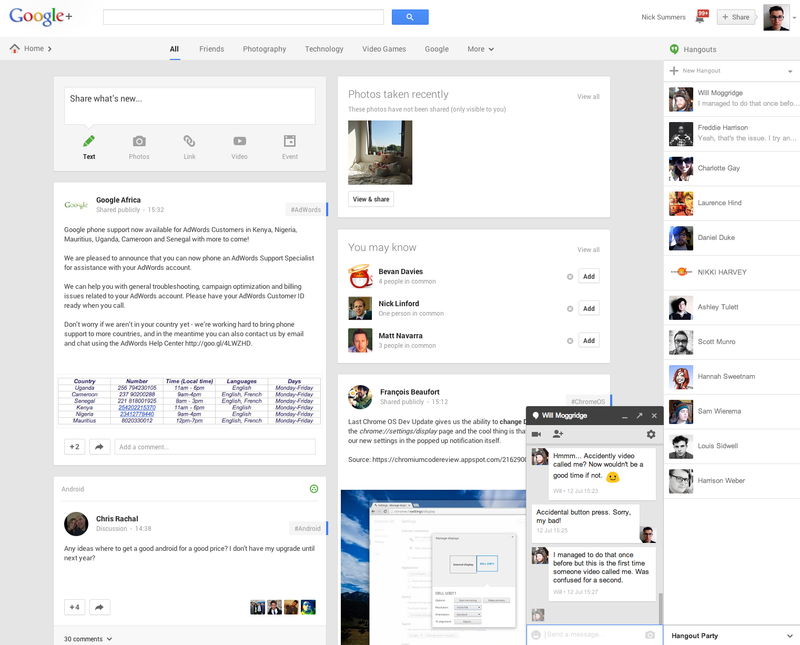 Google’s latest attempt leans on Google+ for user profiles, multiplayer and leaderboards, and why not? The alternative would have been for Google to create another service from scratch – blending the two makes considerably more sense. I’m also impressed by Hangouts. I use a number of different cross-platform messaging apps, including Facebook Messenger, WhatsApp and LINE, but Hangouts has somehow clawed its way onto the home screen of my iPhone. It also resides in the Google+ sidebar on the Web, notifying me of new messages regardless of what browser I’m using. I never planned to use Hangouts this extensively and I never asked for it to be baked into Google+, but now that it is – I don’t think I would ever choose or prefer to have them separated. When I open a new tab in Chrome, a shortcut to Google+ now sits in the top row of my apps page. Back when Larry Page described it as the company’s “social spine”, I was clicking on that icon maybe once every few days. Now, I’m heading to Google+ multiple times a day. From all sorts of different devices. Google+ will always be a social network to me, first and foremost. I go there for what people are posting – the photos, links and nuggets of collective wisdom – but I’m also using it for a whole assortment of other reasons. I realize that my transition to a regular Google+ user is exactly what Google wanted. They’ve won my support, subconsciously and with minimal resistance, simply by blending all of its various services together. But I’m okay with that. Google+ now carries far greater value to me than Facebook – which I visit rather begrudgingly these days just to check my News Feed or remind my school, college and university friends that I’m still alive. Google has always had a clear, long-term strategy for Google+, but until now I wasn’t convinced that it was the right one. I believed that Google users would just avoid it indefinitely, or until they were dragged there kicking and screaming for one reason or another. But I don’t think that’s the case now. Google+ isn’t a breakout success just yet, but it’s picking up pace thanks to the “social spine” strategy that Larry Page was talking about. Google+ has become an ingrained part of how I use the Web and given time, I’m sure it’ll do the same for other Google users too.